One day Lucie and I were looking in the mirror together when she cocked her little curly-haired baby head, pointing to a spot of empty hair, "bow?" I was completely in happy shock. She'd only said three words so far, and I had never even encouraged that word the way I had goofily nurtured the word "momma" for months. From then on she has been a pink-loving, bow-wearing girlie girl, and I love it. Everyday Lucie, now two years old, attempts to raid my make-up drawer, and usually succeeds in applying Chapstick to her entire face. It's a stressful and funny morning routine, part keep-away, part oh-go-ahead and use all my blush. 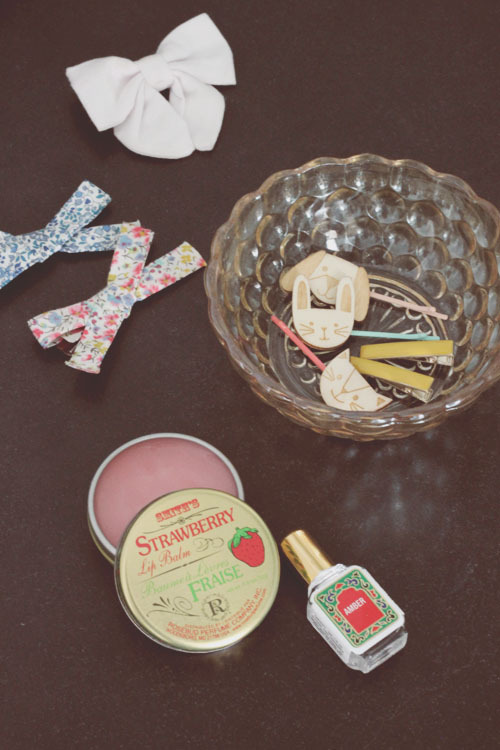 Strawberry lip balm Rosebud Perfume Co.